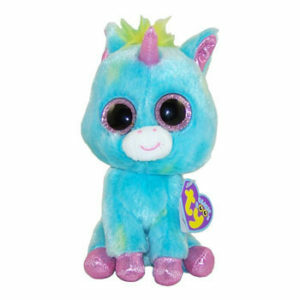 Beanie Boo unicorns can be so mysterious! Most Beanie Boo owners have experience with cats and dogs in the real world. But most owners have never played with, fed or hugged a real unicorn. This is exactly why we felt it important to publish a guide to Beanie Boo unicorns. Who Are the Beanie Boo Unicorns? Here is the list of Beanie Boo unicorns. How many do you have? Pixy is a white unicorn with a golden horn, rainbow colored ears and hooves. Pixy is the only Beanie Boo with rainbow colored sparkly big eyes. Pixy’s birthday is May 26. 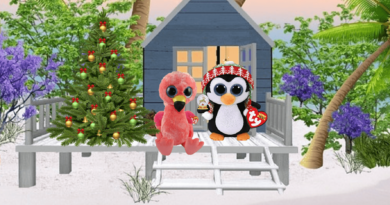 Pixy is a new 2017 Beanie Boo – she’s just been released. Fantasia is a pink, blue an yellow unicorn, with golden hooves, ears and eyes. Fantasia’s birthday is May 8. 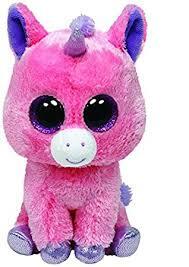 Magic is a pink unicorn with purple hooves, horn, ears and purple sparkly eyes. 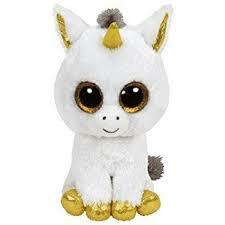 Magic’s birthday is September 20.
Pegasus is a white unicorn with golden eyes, gold hooves, ears and horn. Pegasus’s birthday is November 12. 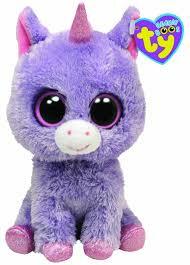 Rainbow is a purple Beanie Boo unicorn with pink eyes, hooves ears and horn. Rainbow’s birthday is May 3. Skylar is a unicorn with pink, green and blue patches, a pink horn, pink hooves and ears and a pink mane. Skylar was born on November 20. Sugar Pie is a light pink unicorn with dark pink spots, pink sparkly ears, hooves, eyes and horn. Sugar Pie’s birthday is March 3. Treasure is an aqua and green unicorn with sparkly pink eyes, hooves and ears. Treasure also has a pink horn. Treasure’s birthday is January 15. 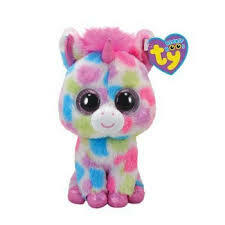 Wishful is a pink, green and blue spotted unicorn with purple hooves, ears and and a purple mane. Wishful’s birthday is November 10. Do Beanie Boo Unicorns Have Magical Powers? 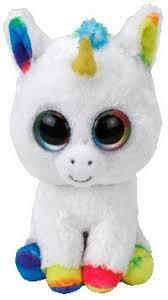 One question on the top of everyone’s mind is whether or not Beanie Boo unicorns have magical powers. To find out the answer, we asked Wishful, Magic and Treasure. They all started giggling, looking down at the ground and kicking their hooves around. Like other unicorns throughout history, I guess Beanie Boo unicorns are shy to reveal their powers, but with names like “Magic” and “Pixy,” we’re pretty sure they can do some amazing things with their horns. What Do Beanie Boo Unicorns Like to Eat? The picture at the top of this page pretty much sums it up: SUGAR! 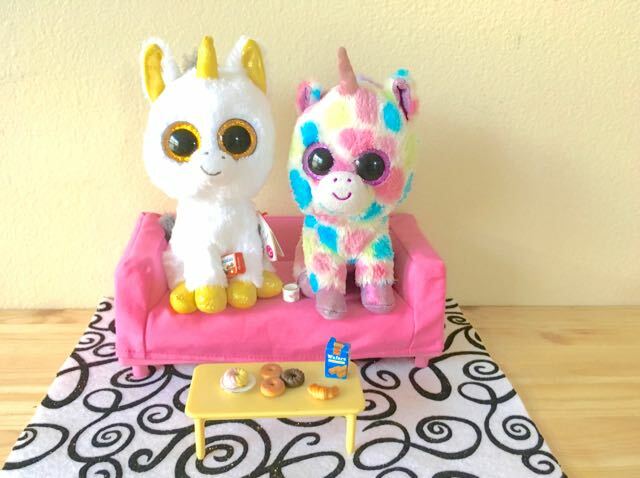 If you notice a sudden disappearance of cookies, donuts or candy once a Beanie Boo unicorn moves in, don’t blame your little brother. It’s the unicorns who are known to raid the kitchen in the middle of the night for sweets. Whatever you do, don’t feed a Beanie Boo unicorn any of these foods. Despite the fact the look like horses, they do not like to graze or eat green foods. What do Beanie Boo Unicorns like to do for Fun? If you like coloring Beanie Boo unicorns and other Beanie Boo animals, check out our Beanie Boo coloring page for free downloadable Beanie Boo art that you can print out and color.